I have always been attracted to Chesterton, partly by his politics, partly by his faith, and partly by his ability to use methods of mass communication to alert his audience to hugely important questions. Above all, and beyond even the genius of Fr.Brown, he was also a great prophet who foresaw the evil of eugenics and which has manifested itself in various forms during the 90 years since he first wrote about it. 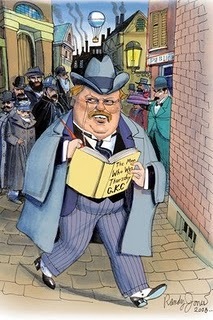 First and foremost, G.K.Chesterton was a journalist of the Fleet Street tradition. He never made any claim to the ivory towers of academia but his intellect was deployed in ways which confounded many of his contemporaries. He was equally at home fashioning thunderbolts in the popular prints or debating the great moral issues. It was at the Oxford Union that one of those debating with him quipped that they felt caught between the devil and the GKC. I believe that his conversion to Catholicism was as important as Cardinal Newman’s had been in the preceding century. The mourners who came to Beaconsfield included Max Beerbohm, Eric Gill, D.B.Wyndham Lewis, Aldous Huxley, Douglas Woodruff, Frank Sheed, Masie Ward, Dr.Hinsley, the Archbishop of Westminster, Monsignors Fulton.J.Sheen and Ronald Knox, Fr.Vincent McNabb and Hilaire Belloc. The latter was to be found weeping as he drank a pint of beer outside the Railway Hotel. “How can his life be in the right, if his whole view of life is wrong? That’s a modern muddle….Heresy always does affect morality, if it’s heretical enough. I suppose a man may honestly believe that thieving isn’t wrong. But what is the good of saying that he honestly believes in dishonesty?” (Fr.Brown in The Crime of the Communist 1935, reprinted by Penguin Books in 1987). But Chesterton should be evaluated against a richer tapestry than the Fr.Brown stories. When many others were blind Chesterton stood at the gates of the twentieth century and saw where it was heading . In Chesterton we have the twentieth century’s prophet of life and the most trenchant early opponent of eugenics.. He saw, when others didn’t, how industrialisation was sapping the human spirit; he saw, when others didn’t, what happens when, through unfair distribution, people are dispossessed from their land and property; he saw, when other s didn’t, the profound dangers to democracy of state socialism, anarchism and unchecked monopoly capitalism; he saw, when others didn’t what happens when a society is secularised and orthodox Christianity jettisoned; and he saw, when others didn’t, the sinister and corrupting nature of eugenics and racial theories. Above all, Chesterton reminds us of what has been lost. Lost through the proclamation of eugenics, lost through the destruction of ‘Merrie England’ lost through our enslavement to capitalism, lost through the hermaphrodisation of women, and lost through the emasculation of the Catholic heritage and Catholic teaching. The century was at its dawn when Chesterton identified these falling shadows. With the century’s setting sun we can now catalogue some of its terrifying infamies: the blood shed of more Christian martyrs than in all the centuries which preceded I; the evils of the holocaust, fascist and socialist totalitarianism; the corrupting of medical ethics and the consequential destruction of life on an unprecedented scale. Chesterton, rather than Shaw, Wells or the Webbs , saw the apocalypse towards which the century was heading.. The subtitle of The Man Who Was Thursday is A Nightmare. Could there be any better description of the twentieth century? The abolition of God inevitably leads to the abolition of the man made in his image and Chesterton saw all this with clarity. Joseph Pearce, in his biography of JRR Tolkien (Man And Myth, 1999) links Tolkien’s hobbits and the struggle in Lord of The Rings to Chesterton’s Merrie England, his rustic radicalism, his love of tradition and traditionalism, and his appreciation of how evil is omnipresent and is our everlasting foe. Tolkien’s faith was shared by Chesterton while Tolkien’s Shire would have been a happy home for the Distributists, Chesterton and Belloc, while the Lonely Mountain of The Hobbit and the later jousts with the forces controlled by Mordor would have been familiar foes for Chesterton. Chesterton’s vigorous opposition to eugenics is often overlooked while we are intrigued by Distributism, engaged by his apologetics, or entertained by Fr.Brown. In 1912 the then Liberal Government brought forward its Mental Deficiency Bill. Perhaps it was a combination of this, the Marconi Scandal, Chesterton’s subsequent dismissal from The Daily News and the Government’s betrayal of the poor (What’s Wrong with the World, 1910)which led him to reassess his Liberal politics and his religious beliefs..
“It is not only openly said, it is eagerly urged, that the main aim of the measure (the Mental Deficiency Bill) is to prevent any person whom these propagandists do not happen to think intelligent from having any wife or children. Every tramp who is sulky, every labourer who is shy, every rustic who is eccentric, can easily be brought under such conditions as were designed for homicidal maniacs. That is the situation; that is the point. (Eugenics & Other Evils, p 20). Chesterton identified the landless poor, incapable of sustaining themselves, as the logical next targets for the eugenicists. In mobilising public and political opinion against eugenics Chesterton stood against a rising tide. The first issue of the Eugenics Review (April 1909) emphasized that the social legislation of the day was “penalising the fit for the sake of the unfit.” Six years earlier H.G.Wells argued that “If we could prevent or discourage the inferior sort of people from having children, and encourage the superior sorts to increase and multiply, we should raise the general standard of the race” (Mankind in The Making, 1903). In 1912 over 750 delegates attended the first International Eugenics Conference, staged in London. Balfour, the former Conservative Prime Minister was there, so was the Liberal Home Secretary, Winston Churchill.. Five years earlier those scions of the radical Left, the Webbs, published a Fabian tract warning that “children are being born freely to Irish Roman Catholics and the Polish, Russian and German Jews, the thriftless and irresponsible…This can hardly result in anything but national deterioration…or this country falling to the Irish and the Jews.” (Tract 131, 1907). This was nothing new. One hundred years earlier, Malthus, in a widely quoted comment to Ricardo, had urged the depopulation of Ireland: “…the land of Ireland is infinitely more peopled than in England; and to give full effect to the natural resources of the country, a great part of the population should be swept from the soil.” During the Irish famine which followed the British Government had a calculated policy of non intervention. Eight million people were reduced to four million. Three million emigrated and one million died. Ever since Malthus predicted demographic disaster two centuries ago the hand wringers have been proved consistently wrong. Today, on average, people are better fed, with a higher life expectancy than ever before. Tackling poverty and cultivating prosperity has proved a more effective means of curbing exponential population growth than any Malthusian remedy. In 1803 Malthus had argued for coercive legislation targeted at poor families who reproduced. One hundred and ten years later Churchill told Asquith that “the multiplication of the feeble-minded” could not go on unchecked and he argued for compulsory sterilisation rather than the more expensive option of incarceration. Beyond our English shores the eugenic forces quickly regrouped and, without a Chesterton to oppose them, they were far more successful. In what Chesterton called “the curious commonwealth of Mr.Hitler” eugenics laws were passed in 1933 and by 1939 250,000 so-called “degenerates” had been sterilised, over half of whom were categorised as “feeble minded.” By 1939 euthanasia had been introduced for all severely disabled or mentally ill people. The way had been paved for Dachau, Auschwitz and Belsen. To what else could such a monstrous ideology lead? Under the influence of Hegel, Nietzsche had dreamed of a higher sort of man. He claimed that Christianity, with its upholding of the weak – and erroneous belief in meekness, forgiveness or mercy – had constantly sought to undermine the creation of this perfect humanity. Hitler echoed this belief in his remark that Christianity, “taken to its logical extreme, would mean the systematic cultivation of human failure.” As for conscience, Hitler dismissed it as “a Jewish invention, a blemish like circumcision.” Chesterton saw this ideology for what it was. He knew that the idea of destroying a life which has lost its social usefulness springs from weakness, not from strength; that the right to life is entirely divorced from questions of social utility. Chesterton knew that what was truly feeble-minded was to base ethical decisions on something as vacuous as personal choice: “To admire mere choice, is to refuse to choose, he wrote (Orthodoxy). Eighty year later, domestic eugenics is packaged with all the decorum which modern public relations can muster. Baroness Warnock in her “An Intelligent Person’s Guide To Ethics” (1998) wrote that “Unless it is held that all life is sacred” in one of the senses considered already, one must conclude that life itself is not intrinsically valuable. Its value depends on what it is like, its quality. Marie Stopes, one of the great luminaries of the International Planned Parenthood Federation (whose offices housed the Eugenics Society rent free), put it more directly still: No society should allow the diseased, the racially negligent, the careless, the feeble-minded, the very lowest and worst members of the community to produce innumerable tens of thousands of warped and inferior infants. This agenda has led to 40 million abortions world wide annually; In China it has led to the one-child policy and in one year to 21 million sterilisations, the insertion of 18 million IUDs and 14 million abortions. In Britain it has led to 6 million abortions, the ending of one in five pregnancies; to between 300,000 and half a million human embryos being destroyed or experimented upon; to abortion up to birth on a disabled baby; to new laws permitting the creation and then destruction of human embryos for the purpose of human cloning; and attempts to introduce Dutch-style euthanasia laws.. Academics at prestigious institutions like the Nuffield Council go unchallenged when they announce that “species boundaries are not inviolable” and pave the way for scientists to dabble in the grotesque. The nightmare kingdoms of twentieth century eugenics give the state planners undreamed of and unparalleled power. Genetic tests claiming to reveal instability, illness, homosexuality or a low IQ all pave the way for eugenic abortions. Quality controls and perfection tests will see the emergence of a genetic underclass of the uninsurable, the unbreedable, the unwanted and the unmanned. In the caste system to come suitors, partners and predators will be encouraged to eye your genes with envy or contempt. We will become prisoners of heredity and slaves of a manipulated reproductive system. British birthright will be replaced by the right birth. Eugenics leads to the suppression of variation and difference. From laws which create a genetic database for the whole population, it is only a small step to laws requiring the data to be lodged with the State, and to compulsion and the elimination of undesirables. Chesterton also observed that “Tolerance is the virtue of the man without conviction.” In becoming too tolerant of modern eugenics perhaps we have taken to hiding in the clothes of a false tolerance and false liberalism.. Chesterton would instantly recognise our corrupted political system. Writing after the Marconi Scandal he said: “A Parliamentary Commission was appointed and reported that everything was very nice; a Minority Report was issued which reported that some things were not quite so nice; and political life (if you call it life) went on as before.” (Autobiography: The Case Against Corruption). Nothing much has changed. In an age of compromise, clubability and consensus; in an age befuddled by the language of political correctness; in an era which holds that truth is what you want it to be and authority something to be despised, here is a prophetic voice penetrating the insanity of our times. Chesterton said of his hero, William Cobbett, that “he saw what we see, but he saw it when it was not there.” In so clearly describing the nature of eugenics and its consequences Chesterton was also aptly describing himself. By The Babe Unborn (1897, Collected Works, vol II). In dark I lie: dreaming that there Are great eyes cold or kind, And twisted sheets and silent doors, And living men behind. Let storm clouds come: better an hour, And leave to weep and fight, Than all the ages I have ruled The empires of the night. They should not hear a word from me Of selfishness or scorn If only I could find the door If only I were born. 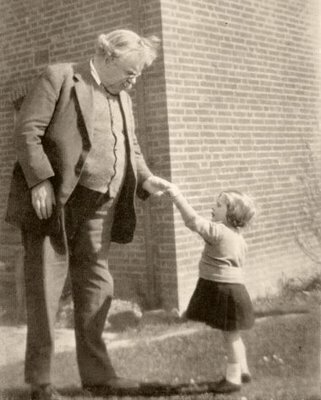 Chesterton’s Distributism was about home and family and property and the protection of the weak, and the Strong Man could not be trusted with them. Chesterton’s earlier disquisitions on Jack and the Giant prepared him to face the threat of Hitler in August 1934: “The strong man is he who can really face the fact that he is weak”, while the “Nordic Man, even when he is born as far south as Austria, will never admit that he is weak”. While his contemporaries, Shaw and Wells, were beguiled by the strength of the Strong Man and advocated the destruction of the weak, Chesterton tried to strengthen the weak and advocated the restraint of the Strong Man. Although all three giants were weak men Chesterton was the only one who did not construct a Utopia in which he could impose his view on others. Excellent. You inspire us to read Chesterton again and show us the history of the twentieth century with Chesterton’s perspective. So Balfour wasn’t a humanitarian? I though he was because he wanted a homeland for the Jews. Was it racism? Did Churchill repent of his interest in eugenics? I am less sure about evolution. Did Chesterton dismiss it completely? Being educated? Able to earn your own living in the way you choose? The poem at the end is marvellous.